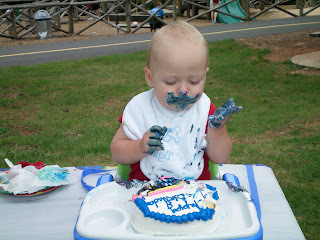 We celebrated Tyler's first birthday today and it was a wonderful treat! I was surprised by his reaction to his birthday cake. I thought he would dive right into it and eat the entire thing. 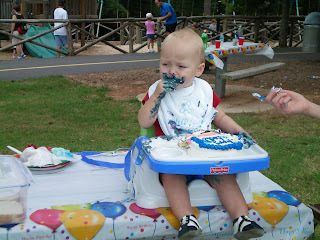 He really liked playing with the icing in his hands and did not eat as much as I expected. 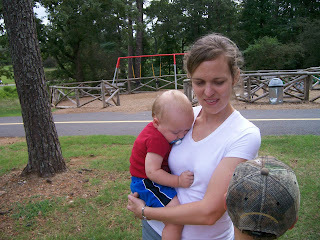 He was slap worn out from the party and fell asleep in my arms at the end. 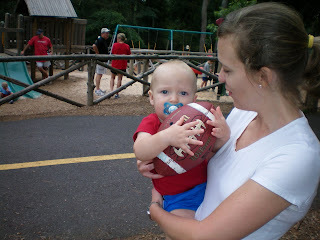 It is hard to believe that it has been a year since Tyler was born. His birthday is this coming Sunday so Trent, Tyler, and myself will celebrate again with food, cake, and gifts but it was great to have family with us today. This has been the most rewarding year of mine and Trent's life. Tyler has brought so much joy and laughter to us. The Lord has taught me so much this year about His unconditional love for us, His children. Being a parent is exhausting and a challenge at times but absolutely amazing and special. 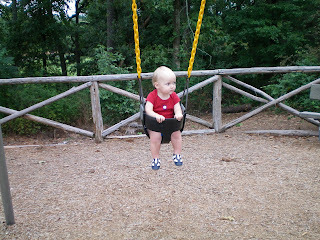 I am so thankful the Lord has given us the opportunity to be parents. We look so forward to the years ahead and pray that our family will honor Him in all we do.